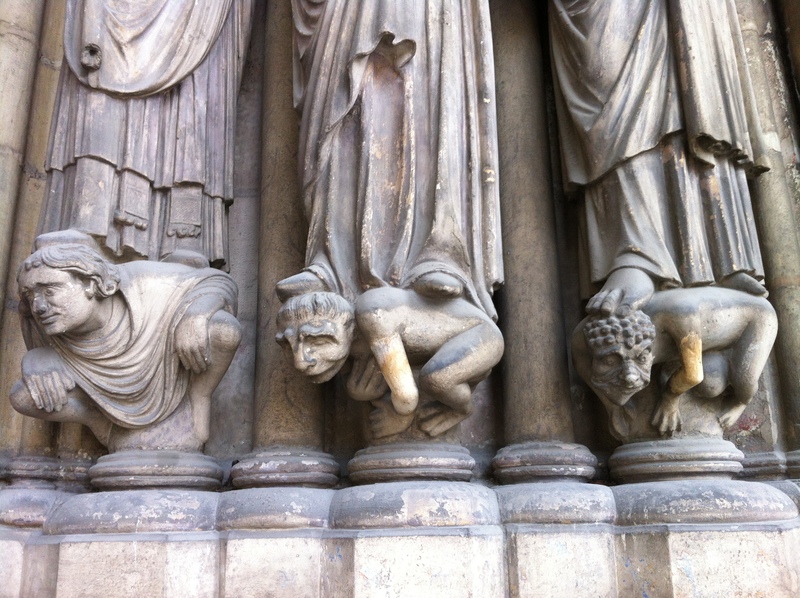 I was about to abandon the little memoir of my recent Paris jaunt, and blog instead about other things. Time- after all- marches on. Tempus fugit and all that. But then I looked at some photos saved on the computer, of statues, saints and angels, one of Mary Magdalene even. Inevitably, thoughts turned to Paris once again. These pictures below date from our third day there. As mentioned previously, it was on the chill side, freezing under these fine, clear, bright blue skies. But we found welcome refuge from the frosty air in the fabulous Saint-Germain l’Auxerrois chuch, one of the oldest in the ancient centre of the city. 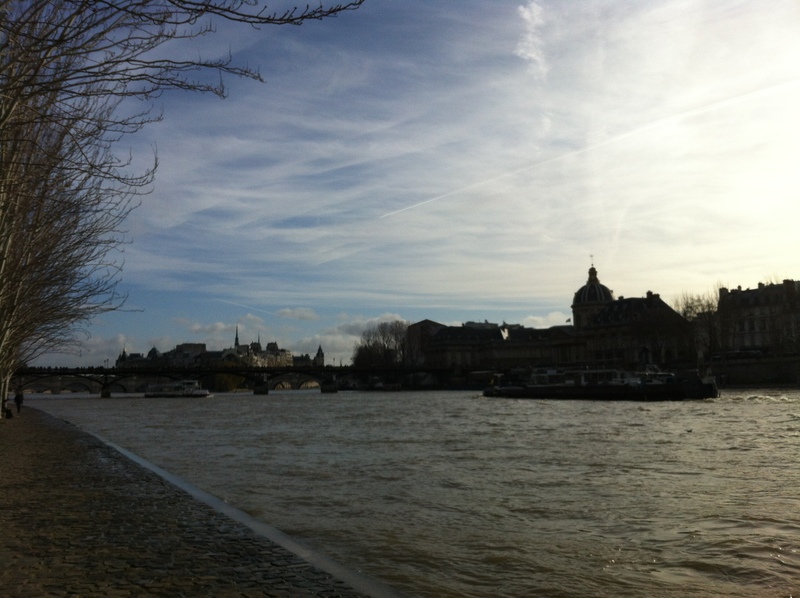 It’s very near the Isle de Cite, just minutes from the Pont Neuf (bridge) and almost across the road from the east flank of the Louvre. 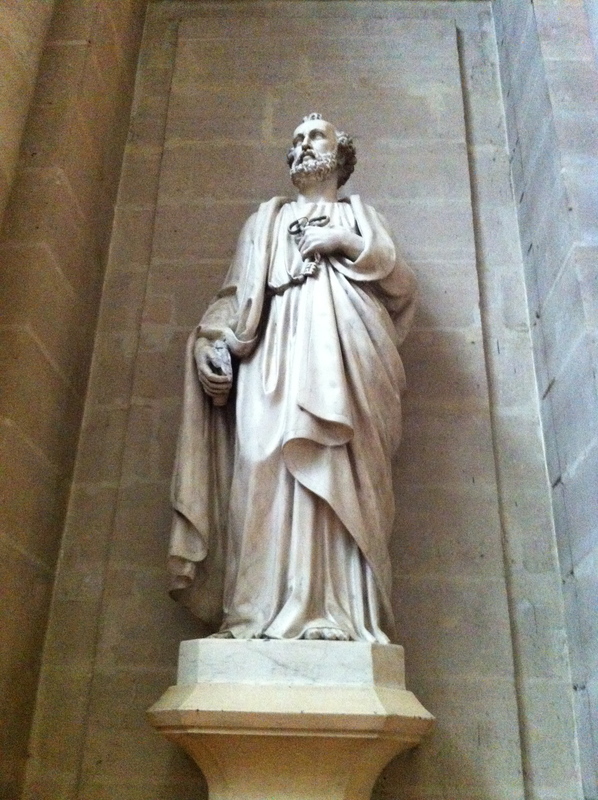 Saint-Germain l’Auxerrois is a wonderful church, and as it was the royal chapel of the kings pof France (prior to Sainte Chapel) it is absolutely packed with history. Some of that history, alas, is very dark. Notably, the bells here are indelibly linked to one of the most notorious massacres in history, namely the organized killing, then disorganized mob-slaughter, of thousands of French Calvinists- the Huguenots- on Saint Bartholomew’s day, August 1572. But of course, much of the architecture here predates the horror of 1572, indeed dates from long before the schism of Reformation. Those older features include a wonderful Gothic Rose window and an amazing Romanesque porch. I was tempted to lie and to say I sat down outside the church, and dashed off this modest little oil-sketch. (Just below, do you like it?) 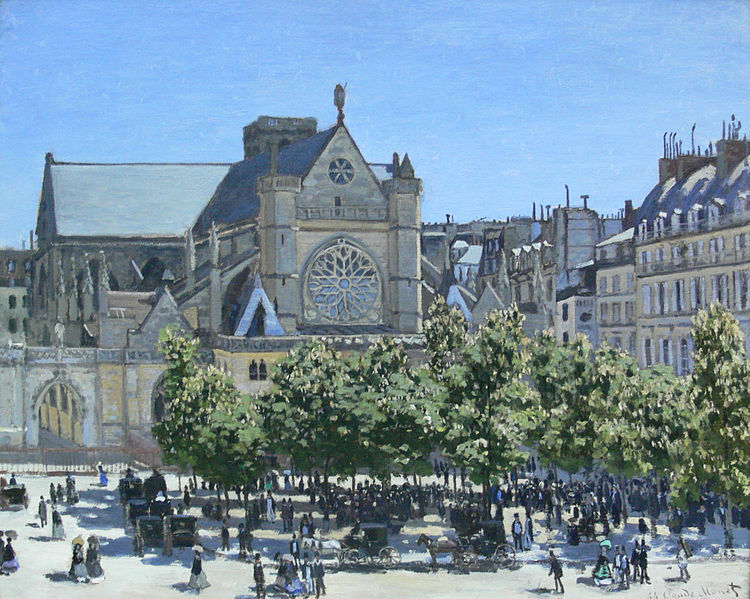 But of course this is by Claude Monet, painted 1867. 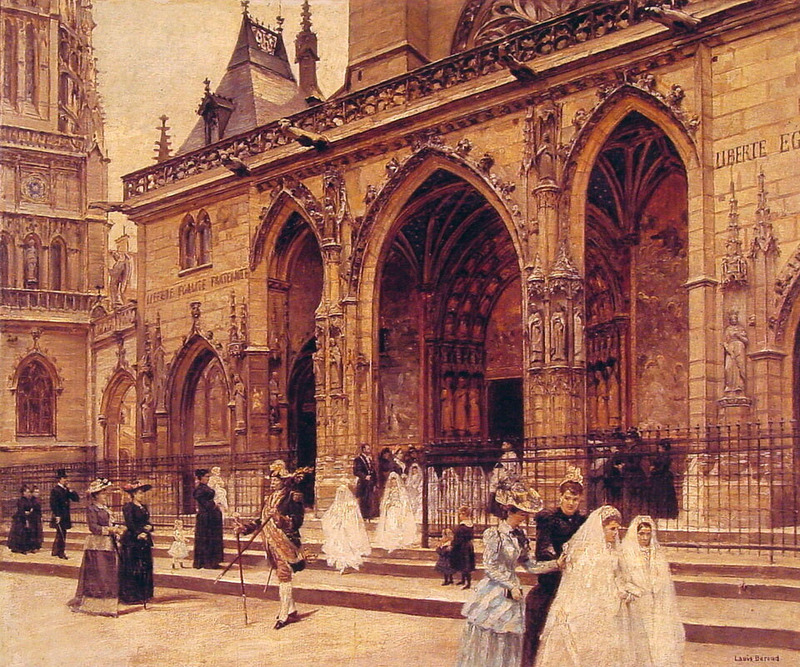 Here also, just below, is another fine painting, this time of the front of the church, by Louis Béroud. It is titled First Communion, and foregrounds the two girls who have just received that sacrament. But Beraud has also done a wonderful job in capturing the stonework of the arches of the church and the lovely Romanesque sculptures that decorate them. We’ll have a look at that, up close, in just a moment. 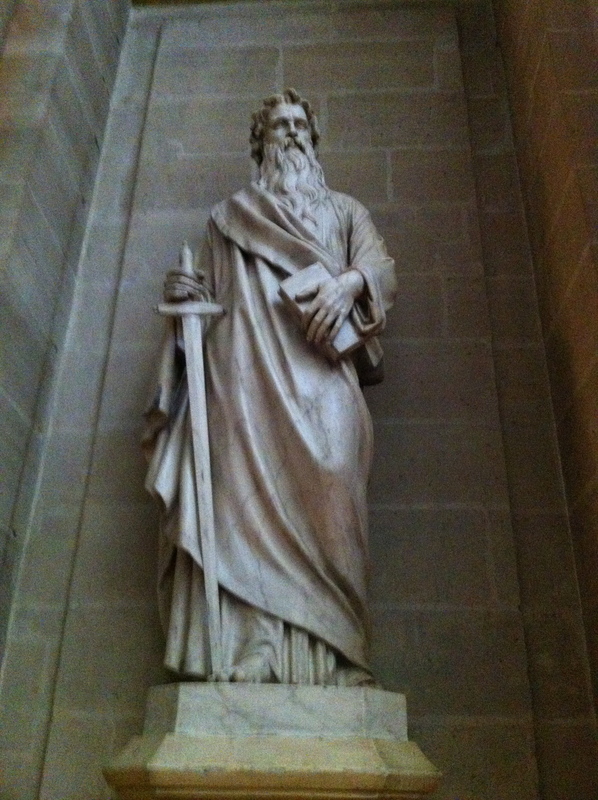 One day he had halted near Saint Germain-l’Auxerrois, at the corner of a mansion called “For-l’Eveque” (the Bishop’s Tribunal), which stood opposite another called “For-le-Roi” (the King’s Tribunal). At this For-l’Eveque, there was a charming chapel of the fourteenth century, whose apse was on the street. Gringoire was devoutly examining its exterior sculptures. He was in one of those moments of egotistical, exclusive, supreme, enjoyment when the artist beholds nothing in the world but art, and the world in art. All at once he feels a hand laid gravely on his shoulder. He turns round. It was his old friend, his former master, monsieur the archdeacon…. “”So you have no care, Master Pierre?” resumed the archdeacon, gazing intently at Gringoire. The priest began to smile with that bitter smile which raises only one corner of the mouth. So lets have a look at what got Gringoire so enthusiastic. Let’s look at the cascading row of recessed, or layered arches, typical of the period. 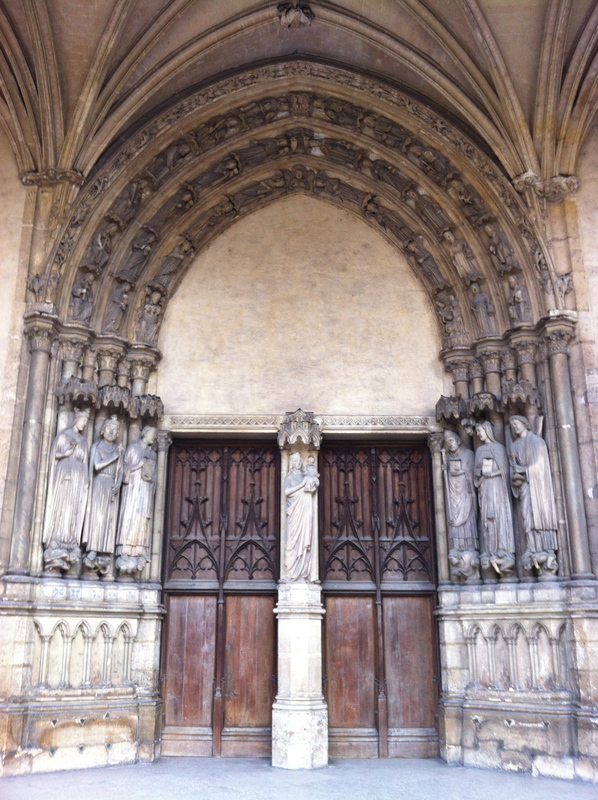 The doors as you see, are flanked by groups of Saints, Bishops and various other worthies, arranged here in two groups of three. 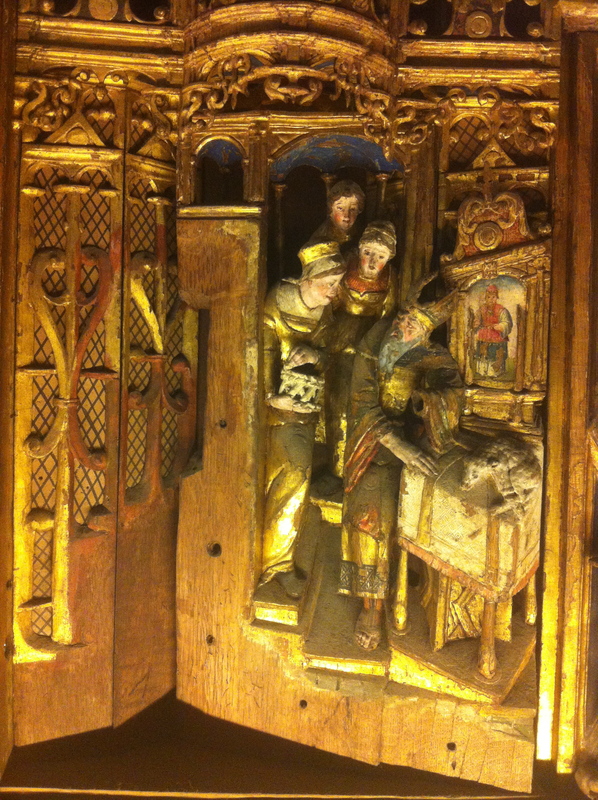 Here below is a detail of the group to the left of the door. And here below is the group on the right. Detail of group on right. So, this motely assortment of poor, dammed wretches and creatures, will not just to burn in hell for eternity. They’ll also have to carry the weight of the righteous on their backs! They look suitably miserable and humiliated, while the worthies above are bordering, I felt, a little close to smug. Do you see one of them is a king?! What awful crime did he commit to find himself in such low company I wonder? I would imagine he was some sort of pretender, or a deposed rival. As mentioned this was the Royal Chapel, so perhaps, well… Power, Propaganda and Art are never very far away. Constant bedfellows really. Anyway, here below, are the corresponding group from the left side. 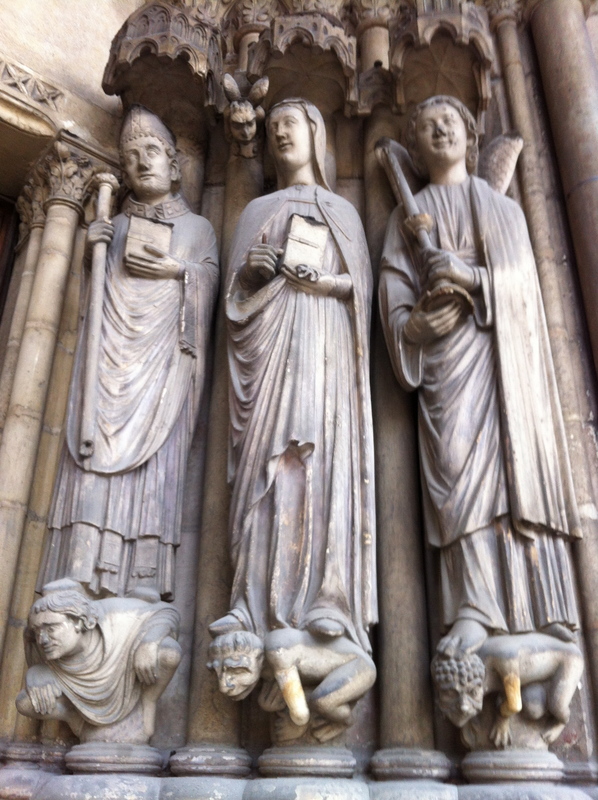 We can see the lower legs of the saints, the main actors as it were, and just below, is a detail of their weight bearing group -the supporting cast, if you like. Sorry, but so hard to resist an awful pun. Anyway, I thought it might interest you to see them. There punishment seems so dramatic, so vivid. 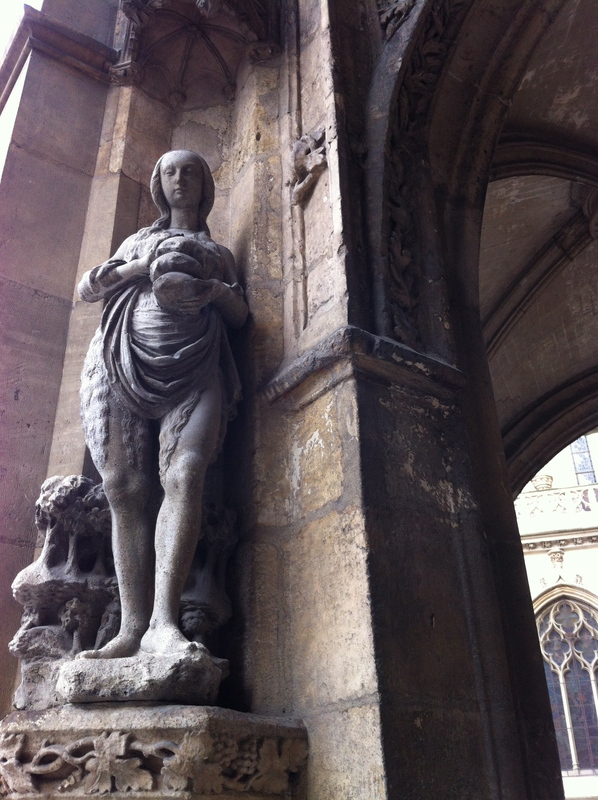 My favourite figure however was this very penitent Magdalene nearby, not quite naked, as became the norm in later art (the medieval era was just too chaste apparently) but with bare legs, and covered in her trademark long hair. She looks – as one has come to expect- suitably penitent, contrite. But she is also earthy & elemental, like another, second Eve. This pair of SS Peter and Paul (pictured individually, below) were rather good, undoubtedly later, and so far more predictable and conventional in the style of depiction than the more vivid, feverish medieval imagination, visible in the porch work and other sculptures outside. Inside lay this fine interior, dotted with more sculpture. 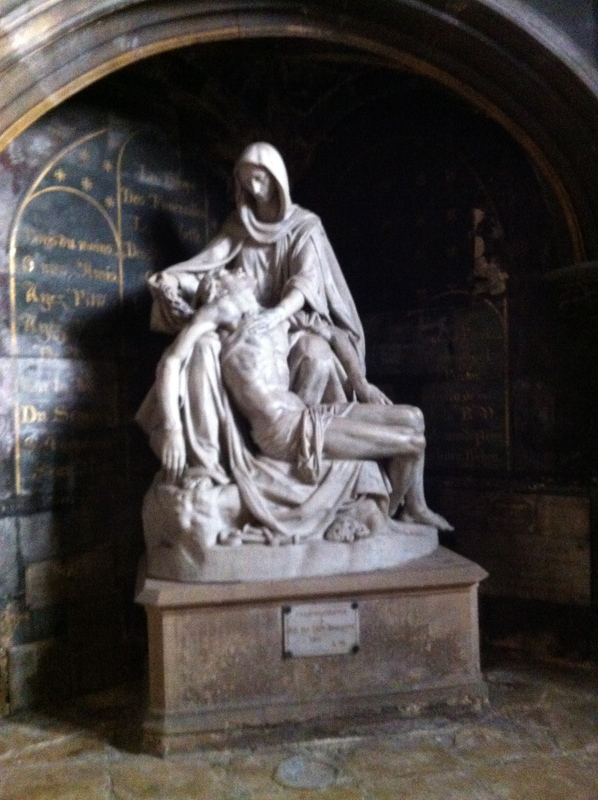 Here is a rather good Pieta, much later than the porch work, but again very good, albeit like the Peter and Paul, rather strictly, almost schematically conventional. Indeed, does this Pieta remind you of another sculpture of the same subject,by any chance? Perhaps by a famous Italian artist? It is evidence, one presumes, of the huge, extraordinary influence exerted by the great Michelangelo on later artists. But also evidence perhaps also of the manner that artists from and after the Counter-Reformation period, were encouraged or at times forced to work along strictly-delineated, theologically-approved lines, “Don’t paint or sculpt anything we don’t like or approve or understand, or we’ll have the Inquisition on your back” -was essentially the creed. Some artists, (most famously Paolo Veronese) were indeed hauled in front of the Inquisition. But most knuckled under and created work along approved lines. They were effectively forced to work within the parameters of approved models, models like of course, the great Buonarroti. So this great rebel, the iconoclast and genius (albeit a devout one) was shoehorned, posthumously, into the unfamiliar role of “the ideal” – a used to beat younger or later artist over the head with. “Copy this. Copy the great, the divine, Michelangelo”. How he would have turned in his grave. The medieval mind was at least equally pious (to the Renaissance mind) It was at least equally obsessed with the divine, with theological and liturgical exactitude. Yet, contrary to received wisdom, at times the medieval mind, the visualisation of religious and spiritual figures and images, in fact seems freer somehow, less bound by convention, by received knowledge and received ideas, by doctrine, dogma and fear. 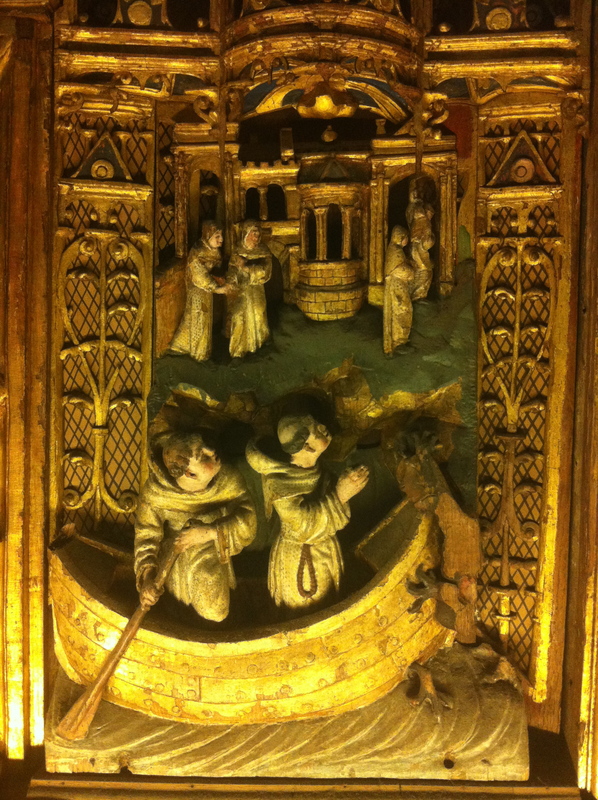 Here (below) are two details from a gold leaf covered altarpiece. “Yes, certainly!” said the priest. If it was good enough for Victor Hugo, (communicating his enthusiasm vicariously through Gingoire) then it is certainly good enough for me. 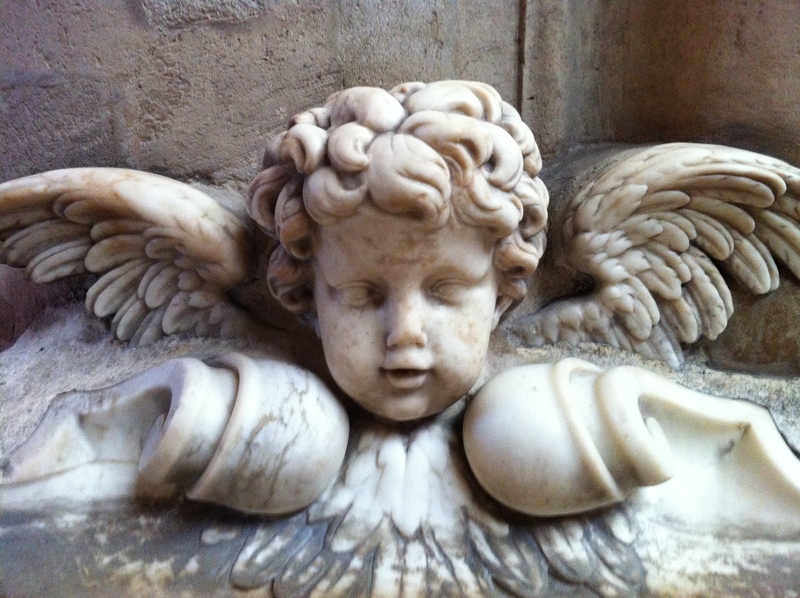 Here is a nice angel, from Saint-Germain l’Auxerrois, of course, to sign off with. Who, after all, is not partial to the occasional angel? Next post: about birds I think. Yes, birds. Small ones. In cages, alas. Or old science, and astronomy. Or the world’s first meter measurement. Oh, who knows? Until then… au revoir. If you enjoyed this post, please leave a comment. I have to write it! Polish reaction to the St. Bartholomew’s Day Massacre was the Warsaw Confederation (1573). Poles created a first in Europe legal basis guaranteeing religious freedom for adherents of all religious faiths in Polish-Lithuanian Commonwealth. Thank you WM, that is indeed extremely interesting. I think many people think of Poland as being quite Catholic and socially & religiously conservative, but that is wonderful. What a civilized, enlightened piece of legislation, at a time when, as we all know, catholics and protestants were butchering each other, in the most cruel and barbaric manner, all across Europe. Yes, wonderful laws, far in advance of their time. Speaking as the son of a catholic mother and a Protestant father… thank you very much! Thank you, Arran, for your nice words about my country and for so interesting information about your parents. As I used to say my mission is to share knowledge about Poland, The Most Serene Republic – a multicultural country with friendly citizens. This is a really interesting piece Arran. Great pictures and referencing the work of Victor Hugo was erudite and very effective. Looking forward to your next post, whichever option you choose. Thank you very much for your kind comments. There is always so much to write about, in this wonderful world of blogging. Delighted you enjoyed this one. The Magdalene and the little tortured sinners (in as you say a supporting role) are spectacular. She looks unlike any sculpture I’ve ever seen– looks more like a painting. What is she holding in her hands? hi there. Yes, now you say it, that is a very, very, good question. What, on earth, is she holding in her hands? I’ve looked and looked and, as far as i can make out, they look more like loaves of bread than anything else. What do you think? I studied art History but I can not recall loaves of bread being one of her “attributes” or symbols. I’ve had a quick look around (googleworld) but no joy as yet. Do you have any insights on this? I’ve seen her holding a skull (which this is clearly not). How about loaves of bread? Enjoying your pieces on Paris as I am spending several weeks in the city at present. my pleasure Robert, I always enjoy your writings. 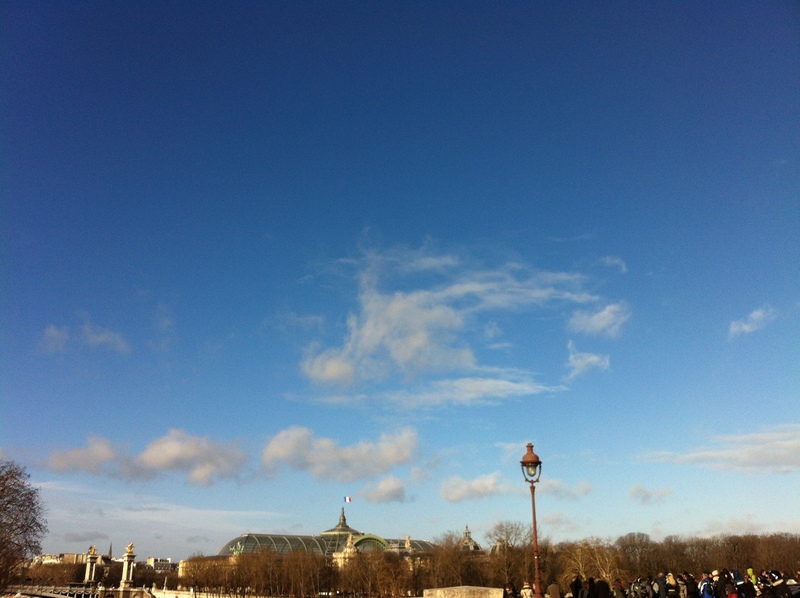 Have a wonderful time in Paris, several weeks is nice leisurely stay. If by any chance you hear or read anything about the unusual iconography of that Magdalene, pictured above, do let us all know! Enjoy your time in the city of lights. -Arran. 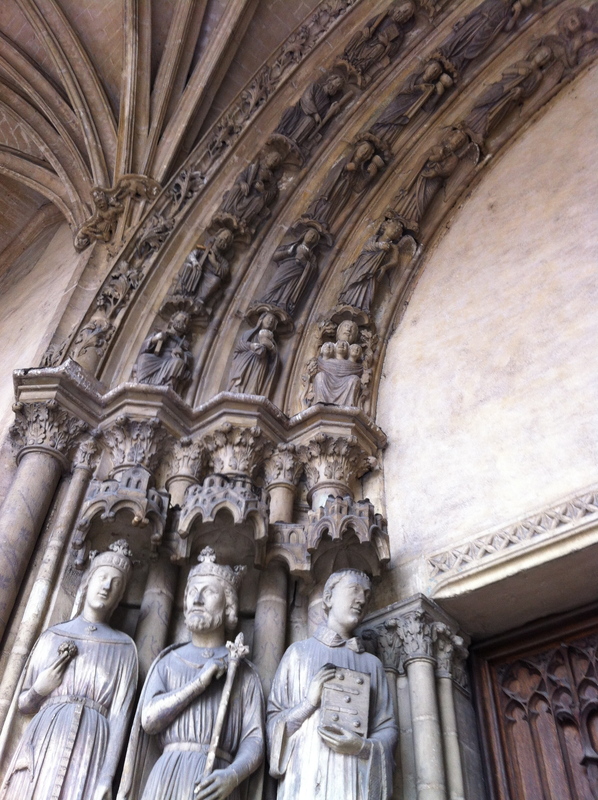 Thanks for the lovely tour of Saint-Germain l’Auxerrois. I’ve only visited Paris once, many years ago. We stayed on the Île Saint-Louis, so I must have been close to this church. I need to return to see more! Your post and photographs are a great guide. My husband is descended from some Huguenots who fled France. They took refuge in Germany and acquired the name Havenor. (Or so the family lore says.) Some moved to England, then Ireland, marrying Catholics. Some of these Catholic Havenors moved from Ireland to Wisconsin in the U.S., keeping the name Havenor. The Catholic Havenor (of whom my husband is descended) then married a Lutheran from Norway and raised their children Lutheran. Their daughter, my Lutheran mother-in-law then became a Catholic when she married a Catholic of German and Polish descent. I see you noted that are the son of a Catholic mother and a Protestant father. We saw a monument to Huguenots in the Cape Town, South Africa area, where many settled. Unfortunately, we didn’t have time to go to the Huguenot museum. many thanks for your thoughtful reading and response, very interesting to hear about your and your husband’s family. Its fascinating how many families move from being catholic to protestant and back, across generations or across different branches of the same family. It’s very common, and quite poignant, in Ireland, where the divide has often been so bitter and bloody and unfair. Anyway, many thanks again, very pleased it is interesting to you. As an Anglican (Episcopalian)-Catholic-Agnostic hybrid myself, please give my best regards to your Catholic-Huguenot husband! Previous Post We’ll always have Paris. 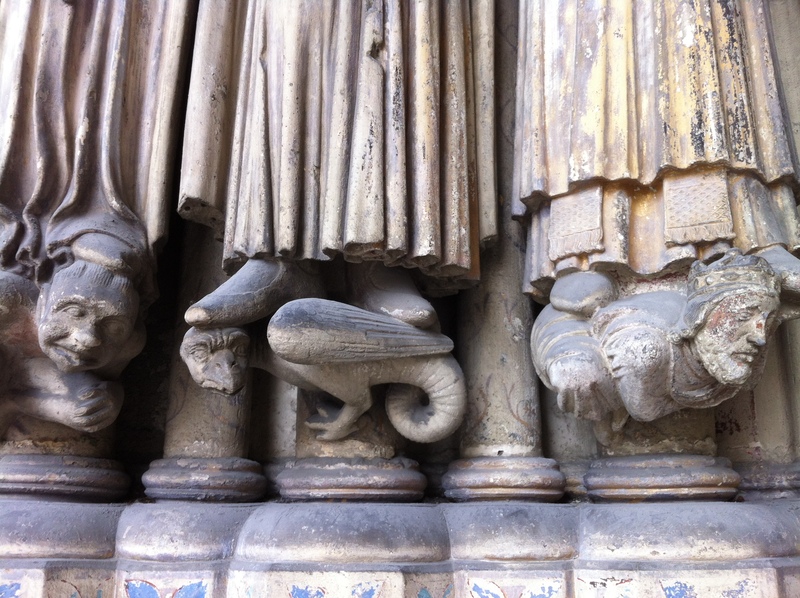 Next Post St Suplice: working out the Equinox, & walking to the metre.